Minneapolis landscaping is our passion; it shows in our design, installation, and customer service. If it sounds like we're having fun providing you with the best landscape services in the Minneapolis Metro. . . We are! Creating beautiful landscapes is our passion at AAA Reick's. We offer complete landscape design, construction and installation services for Minneapolis area residential projects. From the initial concept to the final planting, we do it all. All designs are created by Anthony Reick and are limited only by your imagination. All of our practices, products, and equipment are of premium quality and bring out the best in every landscape. 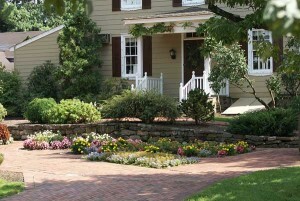 The main focus of a yard doesn't have to be a field of grass with sporadic plantings. AAA Reick's can transform a boring yard into outdoor living areas, perfect for entertaining or enjoying with family and friends. Using a variety of elements it is possible to turn a simple green patch into a private living spaces. Creating such a space is easier than you might think with retaining walls, patios, walkways and plantings toy to define a space. For example, having a patio with a retaining wall that is planted can create a stunning sitting space that is screened from the street or neighbors. Additionally, the retaining wall can add seating to the space. If the same patio and wall combination are separated from the home by a walkway it helps to make the space even more private by distancing it from the house. Let’s face it, it is neither practical nor probable that you will be able to convince all of your neighbors to move away and tear down their homes. All of that isn’t necessary when appropriate measures are taken to screen your neighbors and hide your yard from wandering eyes. Using evergreens along property lines will screen neighboring properties in all seasons, dense tall flowering shrubs can be used if screening is only wanted during the spring and summer. Utilizing a berm along the roadside of a property will help to reduce noise from traffic as well as screening headlights and people walking by. These are just a couple of ways to help turn your yard into a private outdoor living space. Don’t resign yourself to having only a patch of grass with a few plants to enjoy the summer. Transform your yard into an outdoor living space and create an enjoyable sanctuary or private entertaining area.